I have been a fan of Jonathan Wilson ever since hearing his first album Gentle Spirit, released back in August 2011, and timed perfectly during a very difficult period for me – it’s an album that helped me get through that tough year. For the excellent music and the wonderful warm spirit of empathy that it conveyed, Gentle Spirit is my favourite of all of Wilson’s catalogue. However, his follow up, Fanfare in October 2013, is almost as good. Now Wilson returns with his third solo release, Rare Birds, after producing some powerful albums for other elite musicians, touring as Roger Waters’ lead guitarist and playing that role on Waters’ Is This the Life We Really Want? It has been a prolific 5 or 6 years for Jonathan, and this new album is another significant contribution to a catalogue that is becoming one of the best of the second decade of the 2000s. There is nothing missing from this album. It hits a full range of genres, from pop, classic rock, Americana, techno, alternative, hipster, country and progressive rock. The album opens with a trip down the Wish You Were Here long guitar intro highway with Trafalgar Square. You may feel at times that maybe all that time playing and recording with Roger Waters rubbed off on Wilson, but that would only show that this is the first Wilson album you have heard. Pink Floyd’s influence can be heard in all of Wilson’s solo work. Trafalgar Square opens with the brilliant lines, “I’ve seen you walking through Trafalgar Square, little Billy Shears was on piano”, the Beatles reference with sounds of Floyd… and we’re off and running again. This is one of the best tracks, with spectacular guitar in all forms, solid supporting drums, keys, and bass. That funky back-beat and Waters–like reverbed vocals is just so imaginative. Wilson’s dreamy work behind the scenes that you must listen carefully to pick up all the unique sounds. There is so much musicianship on all his albums that it takes many listens to be able to capture all of it. The keys, synths percussion, and multiple guitar sounds are well worth waiting for every time… “with God’s love shining down”. Me is the deeply introspective song that I hoped it would be… complete with ocean waves and maybe seals or whales in the background. “A cry for deeper understanding” – yes, that is what it is. And if your mind is open, you will go there with him and examine your own life. The music supports your ability to fly out of consciousness and explore with him. I couldn’t have said it any better, and the next song, Over the Midnight, is one of those “journeys in sound” and “a psychedelic gossamer-winged music”, like some of the best from his first two albums. There is also enough of that wonderful Laurel Canyon influence to make anyone happy. This song has an accompanying video directed by Andrea Nakhla, who says: “I wanted the visual to mirror the dreamy lyrical landscape of the tune”. Surprisingly, Jonathan Wilson describes his music as being more closely influenced by such artists as, “Talk Talk, Arthur Russell and a ‘Sleigh Bells-meet-George Harrison’ kinda thing”. I was with most other critics who placed him more closely with CSN, Tom Petty, and Dennis Wilson. Either way, there is plenty to enjoy for any fan of all the above-mentioned musicians. There is a Light is the best song on the album for me. The lyrics are a positive fog light, shining through all the haze and desperation that has filled the air in the U.S.A. and the world since the 2016 election. This is what we all needed, the positive emotions, lyrics, and music. It brought tears to my eyes on first listen, an anthem we all need here and now, set to perfect music and rhythm. The title track is another stand out, with lyrics that grind hard, just like the heavy lead guitar that opens the song, and 49 Hairflips is a perfect commentary on the modern world, set to pounding piano keys, like a modern Let it Be. Wilson sings, “…while the rest of them are posting their lives… ah, these kids will never rock again… sign of the times…No, we don’t believe in anything…”. Yes, the younger generations are too busy with their phones, perfect lyrics set to great guitar, drums and driven piano. Wilson ends with, “I’m not leaving these walls without the prettiest song I can find”. Well, he did. Lana Del Rey and Josh Tillman (Father John Misty) appear as backing vocalists on 49 Hairflips and Living with Myself. Miriam Montague is the perfect Beatles’ throwback song, complete with well-placed, deep sitting bass and that violin pacing rhythm we all remember from Eleanor Rigby and other Beatles’ classics. Mullholland Queen is another powerful closer from the modern king of powerful closers. Both of his first two albums had strong closing words and music to remember; and this album ends well with powerful lyrics singing out to a lost woman, or the area of California he loves the most. No matter… either one is beautiful in its own way. It will bring a welling of joy, or tears, whatever your mood. 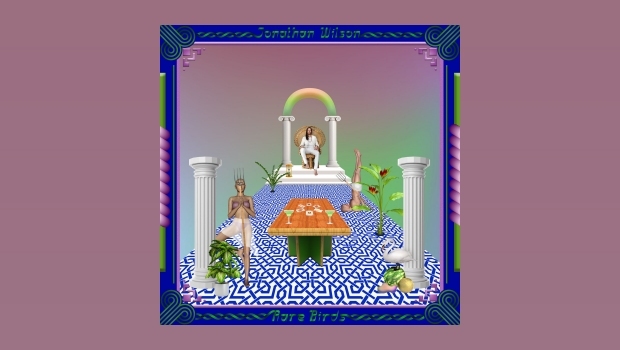 Jonathan Wilson has done it again. Easily one of the best albums of the year, I am already interested in hearing where he goes from here. Get this album, put on your headphones and enjoy the whole thing. Every song is great, even if I did not mention all of them in this review.